Germán ‘Mani’ Frers is the third generation of a family all bearing the same name. His grandfather began designing yachts back in the 1920’s and by 1930 the Frers yard employed 60 boat builders, mostly constructing his designs. Germán Frers Snr began by designing and building Colin Archer styled double-enders in Buenos Aires back in 1926 and went on to draw more than 600 boats ranging from plywood day sailers like the Yachting World Light Crest to a range of motor yachts, and a series of very successful ocean racing yachts. Mani’s Father, Germán Frers II, shared this passion for design, and after a training period working for the famed naval architects Sparkman & Stephens in New York, moved back to Buenos Aires in 1969 to take over his father’s design firm. Frers II became one of the most respected and successful designers of his generation, his yachts winning all the major yacht races around the world including the Newport Bermuda, Fastnet, Sydney Hobart and the Whitbread Round the World races. Germán ‘Mani’ Frers inherited this love for boats and an equal passion for design. He studied naval architecture at the Southampton Institute at the time when design was moving fast from pencilled lines to the high science of computer aided design (CAD), Computational Fluid Dynamics (CFD) and advanced composite engineering. 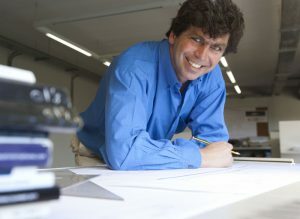 He graduated with a First Class Honours in 1993 and joined his father at the Frers design studio in Milan which Germán Frers II had set up the year before to research and design a series of successful America’s Cup yachts for the Raul Gardini led Il Moro di Venezia Italian America’s Cup Challenge. Here Mani helped to develop the Velocity Prediction Program (VPP) which later became an essential testing tool for all future Frers designs. He also drew the design for the 85ft IMS maxi yacht Boomerang, winner of the Bermuda and Fastnet classics, and the 40’ IMS World Champion Yah-Man. Mani also produced designs for a number of Open yachts that were successful in races throughout the Mediterranean. These include Red. Red Wine, which dominated her class in the 1994, ’95 and ’96 2-man Round Italy Race, and the Este 24 production trailer/sailing yacht, winner of the Mini Offshore IMS Championship. In addition, he formed a close relationship with Luca Bassani, the trend-setting owner of Wally Yachts, which led to the development of a series of strikingly clean looking performance cruiser/racing yachts. The first was the 24m Genie of the Lamp that could be sailed singlehanded or with a full crew. Genie of the Lamp was a class winner at the Maxi Yacht Rolex Cup in 1999 and 2000, and was followed by her sistership Magic Carpet, the Wally 97 Yam, Slingshot and Tikititan. In 1999 Mani and his father teamed up with American designer Doug Peterson to develop Luna Rosa for the Patrizio Bertelli led Prada Italian America’s Cup Challenge. Their yacht Luna Rosa went on to win the Louis Vuitton Cup enabling it to challenge the defender from New Zealand in the 2000 Cup series. The new Millennium brought fresh challenges that would help develop Mani’s multicultural abilities. First came the commission from Nautor Swan in Finland to design the Volvo 60 Amer Sports One which New Zealander Grant Dalton sailed to a podium finish in the 2000/1 Volvo Ocean Race. Mani was then appointed lead designer to Sweden’s Victory America’s Cup challenges in 2003 and 2007 where he led a large design team with the same creative and efficient approach. After, Mani and his Father worked in partnership to design a new generation of Nautor Swan performance cruising yachts, custom racing boats and superyachts, including the timeless classic Rebecca and Jim Clark’s 155ft Hyperion which, two decades on is still winning superyacht events. Nowadays, the Frers design studio in Milan is an independent yacht design firm developing Mani Frers designed racing boats, high performance cruising yachts, motorboats and superyachts both sail and power. Yachts in build include the commission for a 46m tri-hulled motor superyacht from McConaghy Boats in China, and a 56m carbon world cruising superyacht which when launched, will become the largest composite sloop in the world. Other yachts in build include the hybrid powered e-Commuter classic wooden powerboats built by Cantiere Ernesto Riva on a bespoke basis to match each owner’s exact requirements , the Frers MY78 motor yacht built by Baltic Yachts, and the very advanced Frers 46m MCI 155TRI trimaran motoryacht designed for world cruising. The Frers yacht design team in Milan manage all aspects of design, engineering and build including tank and Computational Fluid Dynamics (CFD) testing, and advanced structural engineering right through to final sea trials and handover.